Heard on Hopi Radio, 88.10 FM yesterday afternoon- a drumming group playing the Sponge Bob Square Pants song. Had a good time with Rush visiting. Mainly caught up on things and talked a little astronomy. We drove into Flagstaff Saturday so I could resupply at the Safeway and post to the blog. I had been listening to the Metropolitan Opera station on the satellite radio—all opera, all the time. They play recordings from past Met performances. Driving through the desert landscape with the opera on is a slightly surreal experience. Rush enjoyed it since he used to work as a lighting technician with some opera companies. Each sunset seems to compete with the previous ones for how spectacular they look. 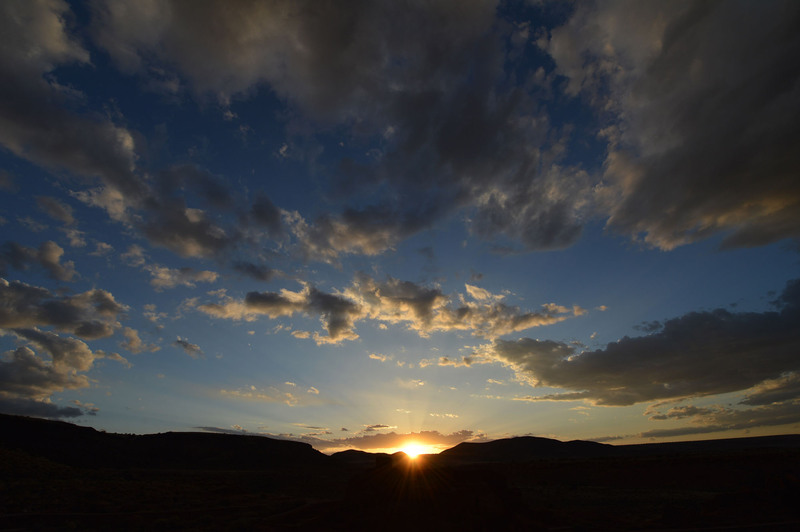 Around 7:00 Rush and I walk to the Wupatki pueblo and were rewarded with a very nice sunset and some amazing cloud formations. Above us and to the east were very ominous looking clouds. The clouds stayed through the night, preventing any star gazing or photography. I woke up at 3:00 am to check the cloud cover since there was a predicted flyover of the space station. Couldn’t see many stars so I headed back to bed. I did a public talk on Sunday afternoon, a small crowd was there to listen. But that turned out to be a good crowd by Wupatki standards, since this park doesn’t get huge number of visitors. At night was the photo class, only had 6 people for that. 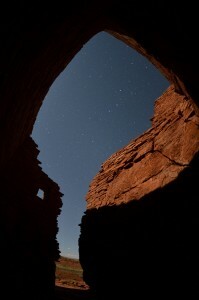 We walked to the Wupatki pueblo behind the visitor center and it was quite a sight in the moonlight. 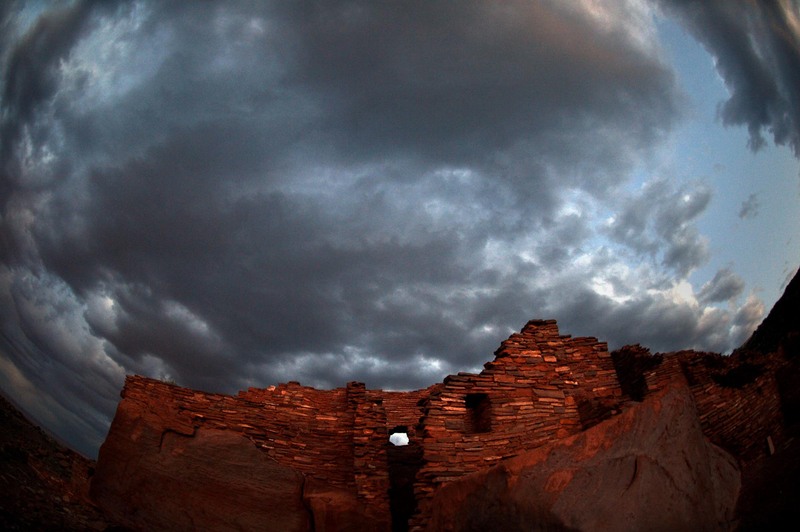 I helped a couple of people with their cameras, then took a few pictures of the pueblo. There is room you can walk into which made a nice shot looking out through the open ceiling and doorway. After the class I almost went to bed, then decided to go out to 2 of the sites. The wind had died down and the sky was completely clear. I shot a bit around Wupatki pueblo, then as the moon neared the horizon, race over to Wukoki, about 3 miles away. The Milky Way was rising over the immense structure. I found a perfect angle as the moon dipped below the horizon. So I’ll go back tonight to get a better shot.